By buying this product you can collect up to 2294 bonuspoints. 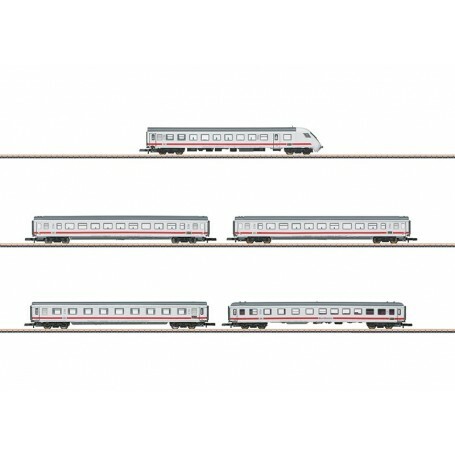 Vagnsset med 5 personvagnar 'InterCity' typ DB AG, totallängd över buffertar 600 mm, epok VI. Model: This is a 5-part car set, consisting of two 1st class cars, two 2nd class cars, and a cab control car. All of the cars have prototypical paint schemes and lettering, interior lighting with warm white LEDs, and interior details. The cab control car has white/red headlights/marker lights that change over with the direction of travel. Total length over the buffers approximately 600 mm / 23-5/8'. One-time production for the Märklin Dealer Initiative (MHI). The 88674 locomotive added to the 87756 car set makes a prototypical train. All of the cars are a special edition, not available separately.